We love integration and integrating in all its forms whether directly or via partnerships with other cloud applications, it’s part of our DNA. 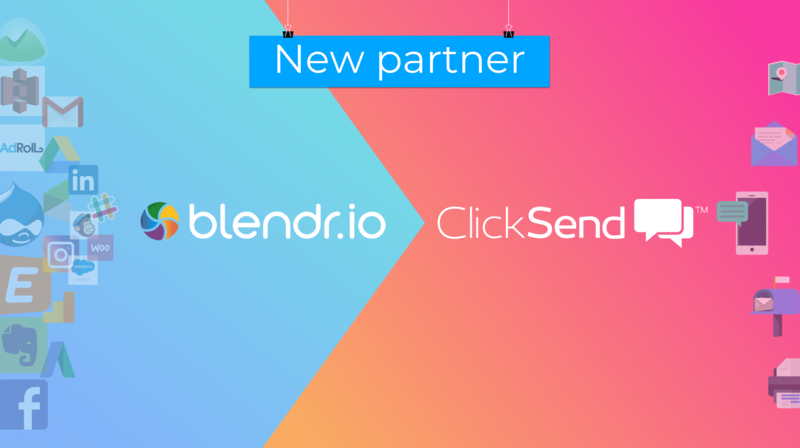 We’re proud to now be an integration partner with Blendr.io, which now means we also integrate with a further 150 other cloud applications. We call this intergreating! 😉 Read on about this match made in the cloud……. Integrate ClickSend with 150+ tools and automate workflows across multiple applications. You are probably using many cloud applications for your marketing, sales and events? But how well do they work together? Do you feel like each tool is a data silo? In this article, we’re going to look at how you can use Blendr.io, a data integration and cloud automation platform, to connect ClickSend with your CRM, webshops, helpdesks, project management tools and other applications. Blendr.io is an integration platform with connectors to 150+ marketing, sales, and events tools. If you are familiar with Zapier, you might wonder how Blendr.io is different. Well, Zapier is a great tool to solve basic integration needs. In case you need to automate complex one-to-one or multiplatform workflows, e.g. trigger a chain of actions based on advanced conditions and variables, you need to use another platform that can offer you more flexibility and more control over your data flows, such as Blendr.io. Here is the full comparison. Connect ClickSend to your favorite tools and automate your workflows. Do you have a specific integration scenario in mind? Let the Blendr.io team know.